Westboro Baptist Church members protested an elementary school in Alamo Tuesday after the group said the school promotes gender diversity. The Kansas-based group picketed outside Rancho Romero Elementary school for its gender equality less plan and for allowing a transgender student to put up a bulletin board promoting gender diversity, according to the group's website and multiple Facebook posts. Protesters arrived at the school at 8:00 a.m., and they were not without opposition. Parents and supporters showed up to the school with rainbow colored umbrellas to counterprotest against the group. 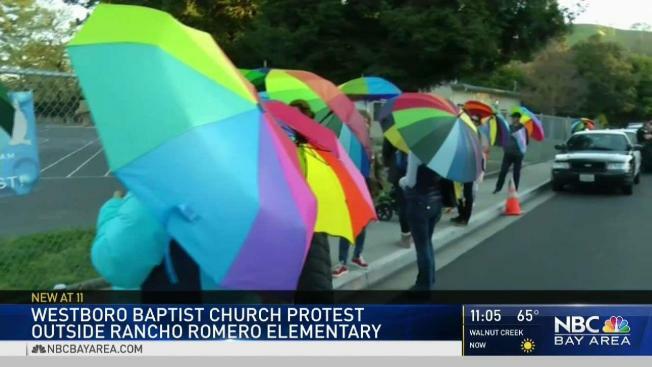 The organizer of the counter rally and parent Wendy Coats told NBC Bay Area said she is there to create a "powerful visual" with the umbrellas to show that every child is loved and valued. The Westboro Baptist Church has planned to protest an elementary school in Alamo Tuesday after the group said the school promotes gender diversity. Pete Suratos reports. Coats is joined by other local activists including Rev. Will McGravey, the Executive Director of the Interfaith Council of Contra Costa County, who said the Westboro Baptist Church also protested in front of four Walnut Creek churches last week. McGravey said he showed up to show solidarity with the LGBT students and to "remind folks that the small hate group does not speak for the broader Christian community or speak for the faith community as a whole." The American Civil Liberty Union also said it planned a "Show Up for Trans Youth" counter rally but canceled due to "wishes of the impacted family and the local trans organizations." The ACLU said instead of a street demonstration, they want to encourage people to make donations to local organizations for transgender youth. No one at ACLU was available for comment but Sandra Collins, Executive Director and Founder of enGender, told NBC Bay Area in a statement: "For many of us who love and support our gender diverse children, the Westboro Baptist Church protest is extremely hurtful, hateful and contrary to the very principles of an inclusive society, especially an our American society." Prior to the protest, the school said its focus will be on the student and staff safety. "We have a plan in place, and are working very closely with law enforcement, to mitigate the impact of the protest on our school," San Ramon Valley Unified School District's Director of Communications Elizabeth Graswich said. 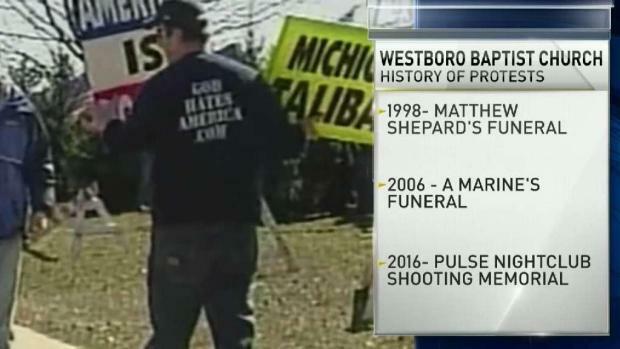 The Westboro Baptist Church is known for its anti-LGBT beliefs and for holding protests across the country, according to the Southern Poverty Law Center.